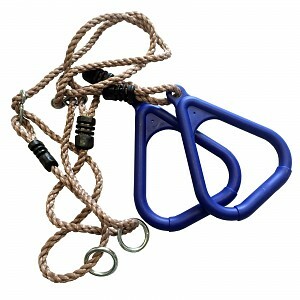 Two triangular plastic rings made of HDPE plastic with PE ropes. These gymnastic rings are extremely weather-resistant. Red color. The rings and hooks (to adjust the rope length) are made of galvanized steel; black rope connections made of PP. For swing frames with head height (clear height from floor to head beam lower edge) up to 2.50 m.